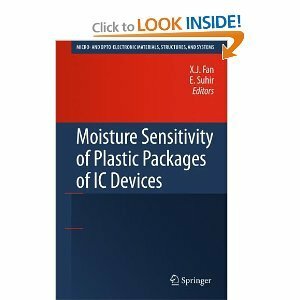 Moisture Sensitivity of Plastic Packages of IC Devices provides information on the state-of-the-art techniques and methodologies related to moisture issues in plastic packages. The most updated, in-depth and systematic technical and theoretical approaches are addressed in the book. Numerous industrial applications are provided, along with the results of the most recent research and development efforts, including, but not limited to: thorough exploration of moisture's effects based on lectures and tutorials by the authors, consistent focus on solution-based approaches and methodologies for improved reliability in plastic packaging, emerging theories and cutting-edge industiral applications presented by the leading professionals in the field. Moisture plays a key role in the reliability of plastic packages of IC devices, and moisture-induced failures have become an increasing concern with the development of advanced IC devices. This second volume in the Micro- and Opto-Electronic Materials, Structures, and Systems series is a must-read for researchers and engineers alike.